People are not the only ones that can get allergies. Man’s best friend can have allergies, too. There are many symptoms of allergy in dogs that most pet parents often dismiss as nothing more than signs of discomfort. While some allergies may be so benign that the only discomfort they give to your pet is intense itching, there are also some types of allergies that can be life-threatening. Allergy testing is one of the best ways you can have peace of mind regarding your dog’s state of health. This procedure helps determine whether your pet has allergies or not. Moreover, such tests help identify the main trigger of the allergy. Here’s everything pet parents need to know about allergy testing in dogs. Before we begin, let’s first have a basic understanding of what an allergy is. Allergy is the dog’s response to the presence of a certain substance called allergen. This substance contains certain types of proteins that the cells of the dog’s immune system recognize as potential threats. The immune system is able to distinguish self and non-self. This means that it has cells that try to determine if the substance that it meets is a natural part of the body or something foreign. If it considers this substance to be foreign, the cells of the immune system will try to neutralize it by triggering the release of pro-inflammatory substances. This produces inflammation. This inflammation produces an environment where the “foreign” substance will not be able to survive. Unfortunately, it is this very same inflammatory process that produces the signs and symptoms of allergy such as the following. The major issue in allergy is that the immune system has become very sensitive when it comes to recognizing friend or foe. In many cases, it mounts an inflammatory reaction to fight substances that are otherwise harmless. 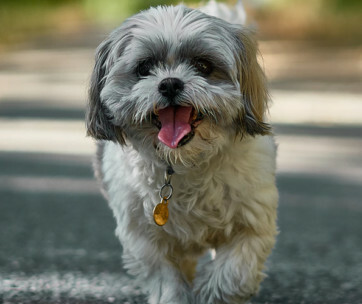 Since allergies in dogs are the result of a hypersensitive and hyper-reactive immune system, there are several types of allergies that can develop. The most common are the following. Two out of every 5 dogs can have flea allergies. This is brought about by the protein compounds present in the saliva of the flea. Only one flea needs to bite on the skin of susceptible dogs to cause an allergic reaction. This can manifest as intense itching, vigorous scratching, and licking or chewing on the affected part. There can also be hair loss. This is a type of allergic reaction that is due to the inhalation of allergens by the dog. While the allergen passes through the dog’s lungs, it can manifest as a type of skin allergy. Atopic dermatitis affects about 15% of all dogs that have allergies. The most common causes of atopic dermatitis in dogs include pollen, dust, and mold. The allergy produces skin irritation, intense itching, and recurrent ear infections. Because the dog will try to alleviate the itching, it will lick or chew on the affected part. This can lead to further irritation and bald spots. There is one very interesting finding among dogs with atopic dermatitis. It is possible that this dog allergy has a genetic component to it. 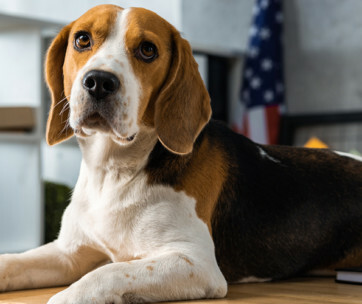 Examples of dog breeds that are more prone to atopic dermatitis include Beagles, Boxers, and Golden retrievers, among others. One out of every 10 dogs can have food allergies. Examples of food items that can cause allergies in susceptible dogs include cereal grains, meats, fish, and dairy products. You might be surprised by the inclusion of cereal grains. Do understand that cereal grains like corn, wheat, and soy also contain proteins and not only carbohydrates. Food allergies can produce itching, face rubbing, wheezing, sneezing, and intense head shaking. There is another type of allergy in dogs that is rare, but can be life-threatening. Acute allergic reaction can lead to anaphylactic shock. If treatment is not initiated at once, the risk of mortality is high. Some of the more common causes of acute allergic reactions in dogs can include bee stings, medications, and vaccines. Diagnosing allergy in dogs requires a meticulous approach to data gathering. Based on the dog’s symptoms and health history, vets can make a presumptive diagnosis of allergy. However, to aid in the confirmation of a particular allergy, the veterinarian can perform any of the following tests. In this test, the vet injects very small amounts of test allergens under the dog’s skin. If you have seen how doctors and nurses perform skin testing prior to the administration of antibiotics, it’s the same thing. What this test does is that it challenges the dog’s immune system to react to the allergens that the vet injected under the dog’s skin. If a reaction takes place after a certain period of time, then it’s said that the dog is allergic to that particular substance. The procedure requires the shaving of the dog’s hair in an area where the test allergens will be injected. This can be on the dog’s abdomen or on its side. Vets use very fine needles to inject the test allergen. The test requires careful and strict monitoring of the dog. Since the procedure involves the introduction of an allergen, it is possible that a full-blown allergic reaction can take place. Prompt treatment is required in such cases. A safer test for dog allergy is serum allergy testing. This involves the withdrawal of a small amount of blood from the dog. A veterinary technician or laboratory technician can study a sample of the blood through a microscope. Here, the technician can analyze the amount of immunoglobulin-E (IgE) that is specific to a particular antigen. The test can reveal the types of allergens that do not cause an allergic reaction, those that cause mild allergy, and those that produce severe allergic reactions. Serum allergy testing in dogs is more popular than intradermal testing since it doesn’t involve shaving a part of the dog’s fur. It is also safer in a way that you are not introducing allergens into the dog’s system. However, since the testing involves microscopic analysis, it tends to be pricier than skin testing. 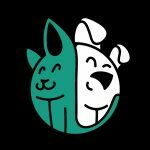 If the vet suspects food allergy in a dog, he will recommend subjecting the dog to an elimination diet. This takes time and involves the replacement of the dog’s usual diet with something more novel. There are limited ingredient diets in the market for this purpose. The idea is to remove whatever diet the dog is accustomed to eating. A replacement diet is given which should comprise of one type of protein that the dog has never eaten before. The fewer the ingredients, the better. The dog is given this diet for several weeks until its condition improves. Once there is improvement, one of the ingredients in the old diet gets reintroduced. This is to challenge the dog’s immune system. If the dog develops an allergy within 2 weeks, then it is safe to say that the dog is allergic to such a food ingredient. If no reaction takes place, then the next possible food allergen from the old diet gets reintroduced. Allergy testing can help zero-in on the specific type of allergen that is the main trigger for the allergy in a particular dog. It is clear that the dog may be allergic to different kinds of substances. This makes allergy testing a bit tricky. It is important for the vet to identify as many possible allergens that are causing allergies in the dog. This is to help the vet formulate a special kind of serum that contains very minute amounts of the identified allergens. The serum will be administered to the dog over a period of time to help desensitize its immune system. This is the fundamental principle behind immunotherapy. Very small amounts of allergens are introduced into the dog’s bloodstream. This is to help acclimatize the cells of the immune system with the presence of these allergens. Because they are small in number, the immune system will not consider them as a threat; hence, there’s no allergic reaction. Over a period of several months to a few years, the amount of allergens that are introduced into the dog’s system increases. This happens in a very gradual manner. It often starts with a diluted formulation of the special serum. As the therapy progresses, the concentration of the allergens in the serum also increases. Most dogs that have allergies respond very well to immunotherapy. However, there are also cases wherein the dog doesn’t respond to such a therapy. These dogs often come with other underlying medical problems that can interfere with the desensitization process. Dog allergy testing is an important tool for confirming a diagnosis of allergy in dogs. 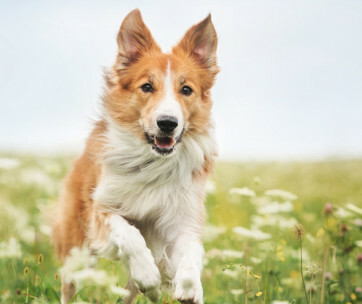 It can also pave the way for the more efficient administration of immunotherapy since the vet now has a clearer picture of what’s causing the dog allergy.